Do you know everything there is to know about rhinos? Perhaps… perhaps not. These facts below are great not only to drop into the middle of a conversation on your next safari or dinner party; they’re also one way to better understand these unique animals. These wild prehistoric animals have complex characters and it’s through us learning more about them that they find a way into our hearts. When we learn, we start to care, and when we care, we protect. So bring these points up at the next game drive or boma braai. Get people to care. The name rhinoceros means ‘nose horn’ and is often shortened to rhino. It comes from the Greek words rhino (nose) and ceros (horn). Rhinoceros have been around for over 50 million years. They haven’t changed much since prehistoric times (though they tended to be a lot woollier back then). Some of the first rhinoceros didn’t have horns and once roamed throughout North America and Europe. No rhinoceros species has ever inhabited the South American or Australian continents. The Sumatran rhinoceros is the closest living relative of this ancient extinct woolly rhino. These rhinoceros had thick, shaggy coats and were hunted by early humans. They are depicted in cave paintings dating back more than 30 000 years. White rhinoceros are the second largest land mammal. The white rhinoceros is the largest rhinoceros species and can weigh over 3 500 kg (7 700 pounds). It is the largest land mammal after the elephant. Elephants can grow to be 7 000 kg (15 000 pounds). Relative to their large body size, rhinoceros have small brains. Rhino skin may be thick, but it can be quite sensitive to sunburn and insect bites. This is why they like to wallow so much – when the mud dries it acts as protection. Some rhinos use their teeth – not their horns – for defence. When a greater one-horned rhinoceros is threatened it slashes and gouges with the long, sharp incisors and canine teeth of its lower jaw. Despite their name, white and black rhinoceros are actually gray. The white rhinoceros’s name is taken from the Afrikaans word “wyd,” which means “wide” and describes its mouth. Early English settlers in South Africa misinterpreted the “wyd” for “white”. Black rhinoceros probably got their name from the dark wet mud in their wallows that made them appear black in colour. Both species are essentially gray in colour. Rhinoceros are speed machines. They can run 48 to 64 km/h (30 to 40 miles per hour); the fastest human can run 24 km/h (15 miles an hour), so finding a tree to climb is a better strategy than trying to outrun a rhinoceros! Rhinoceros pregnancies last forever. Or at least it might feel like it, since they are pregnant for 16 to 18 months! Mother rhinos are very nurturing. The young stay with them until they are approximately 3 years old. Rhinos communicate through poo! They use piles of dung to leave “messages” for other rhinos. Each rhinoceros’s smell is unique and identifies its owner. The poo’s scent can tell a rhinoceros if the other rhino is young or old, male or female and can be used to mark territory. Uncontrolled hunting during the colonial era is the major cause of decline of the white rhinoceros. Today poaching for its horn is the primary threat. The white rhinoceros is particularly vulnerable to poaching, because it’s relatively unaggressive and lives in herds. The white rhinoceros is also losing its habitat due to agriculture and human settlements. The Hoedspruit Endangered Species Centre helps rhinos that have been orphaned and/or poached. These are taken in and given the necessary treatment and security to ensure that they have a future. 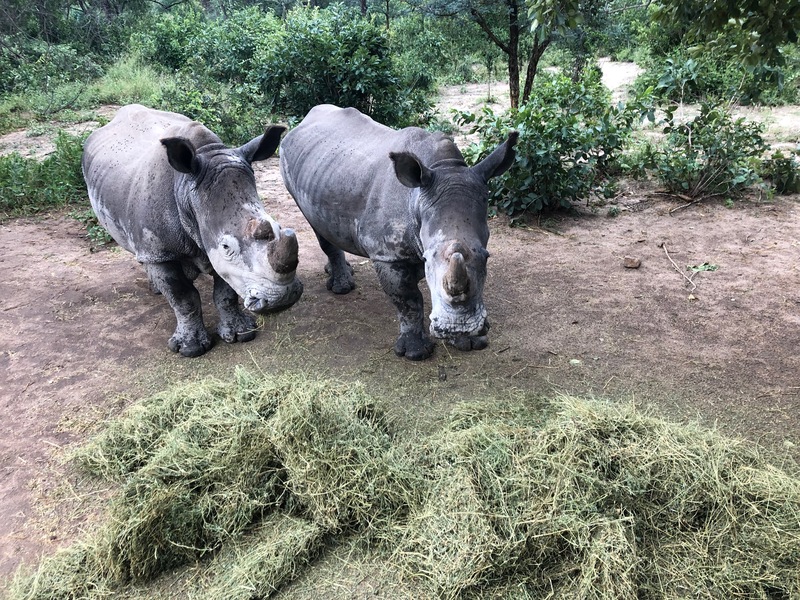 HESC not only provides a home for these rhinoceros, but also educates and creates awareness about rhinoceros poaching in the community.